Face saver headgears﻿﻿ are great for individuals concerned about showing up to work with bruises and black eyes. However, it is not reserved for just day workers. Professional ﻿﻿boxer﻿﻿s﻿﻿ and MMA fighters like Canelo Alvarez and TJ Dillashaw can be seen sparring with them too. The face saver headgear is distinctly known for its face bar that runs across the lower portion of the user’s face. Its overall size can be quite bulky and the facebar does present some challenge to your overall visibility. 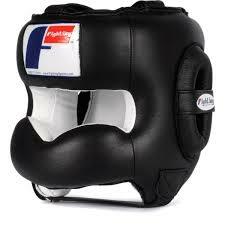 However, this particular type of headgear allows for hard sparring with minimal facial damage and cuts. In no particular order, below are the 7 best face saver headgears available on the market. Winning is a company known for its premium boxing equipment and is a popular choice among professional athletes in combat sports. Winning improved on their previous version of the FG-5000 by reducing its overall weight. Every owner of the FG-5000 seems to rave about the comfort and fit they provide during sparring. In addition to that, its padding is impressive in its capacity to cushion against punches. Relative to other face saver headgears, the peripheral vision for the FG-5000 is one of the best. However, its face bar still has problems commonly encountered by headgears in this category where it impede the user’s visibility againsts low thrown strikes. To adjust and secure the FG-5000 on your head, it has a lace crown as well as laces on the back of the headgear. Due to the laces on the back, there are no padding dedicated for accidental hits to the back of the head. A unique component of the FG-5000 is its chin strap which consists of a plastic clip-in attachment, whereas most headgears use a metal buckle. This design makes it faster to put on and remove the headgear. Without a doubt, the downside of Winning products are their price. The FG-5000 is worth every penny and should be recommended to individuals who are seriously committed to training. The Cleto Reyes face saver is another pricey selection on this list. It is a quality headgear with an authentic leather exterior and is handmade in Mexico. It incorporates a lace crown and two large Velcro straps on the back of the headgear. The Velcro straps are convenient for making minor adjustments by yourself. 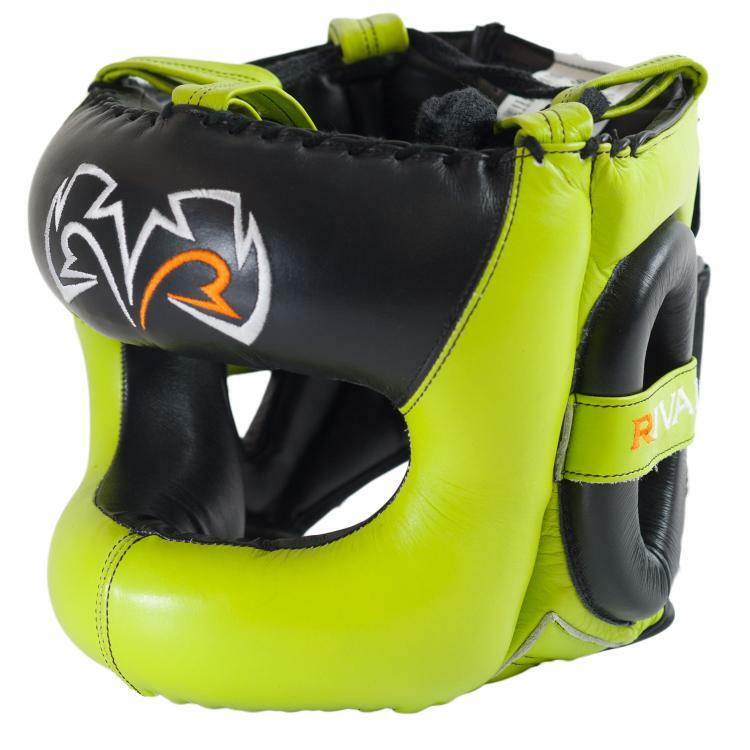 These features permit Cleto Reyes to sell it as a one size fit all option. 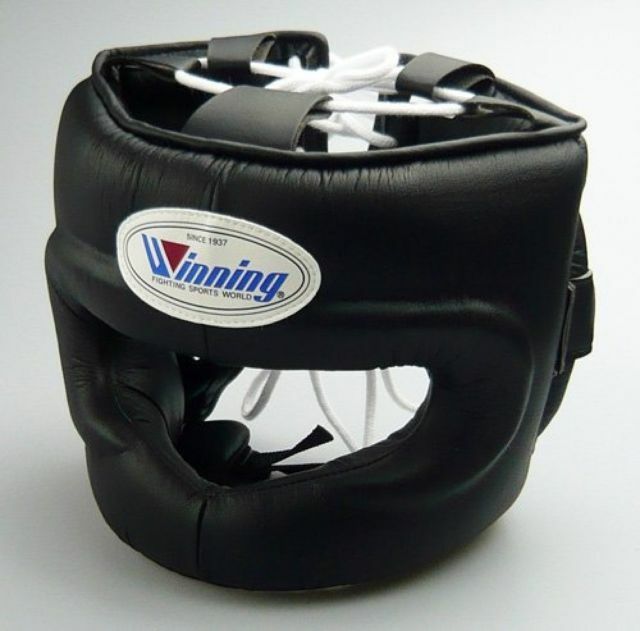 Similar to the Winning FG-5000 headgear, the Reyes lack padding on the back of the headgear. The chin strap for this headgear is adjustable and uses a standard metal buckle to hold on to the leather strap. Unfortunately, this strap is not padded and may be uncomfortable at times. The padding around the perimeter of the ear is excellent, but it is missing the ear bar that is commonly associated with these types of headgears. Cleto Reyes headgears are frequently mentioned with Winning as the best headgears for boxing. 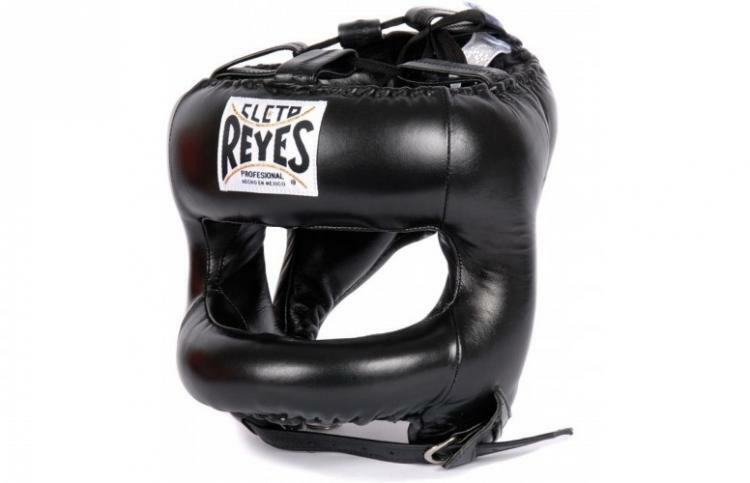 This specific face saver headgear from Cleto Reyes is well-padded, tough and should have no problem protecting your face from powerful straight punches. 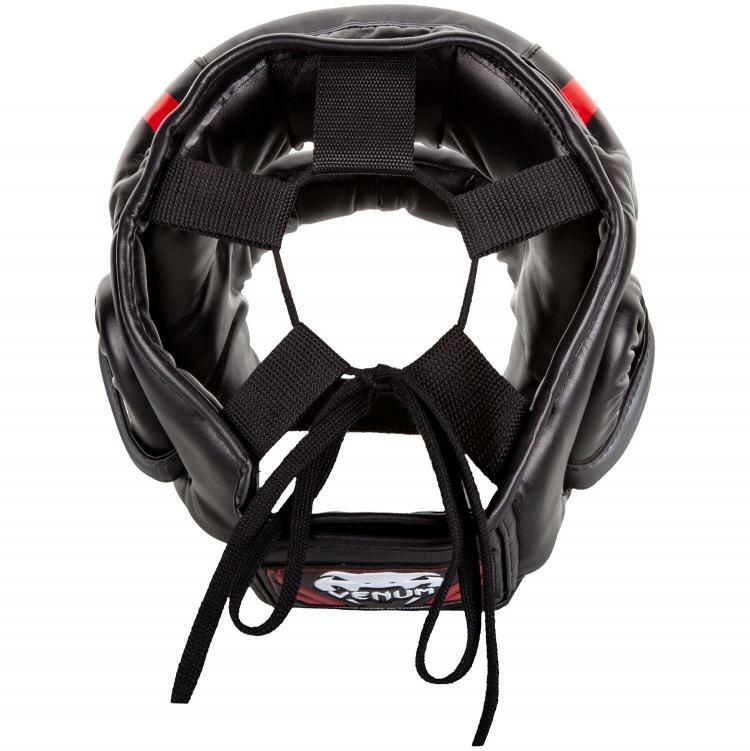 This Deluxe face saver headgear from Ringside has excellent peripheral vision, but runs into the same problem as most face saver headgear due to the face bar interfering with an individual’s visibility pertaining to lower body shot and uppercuts. 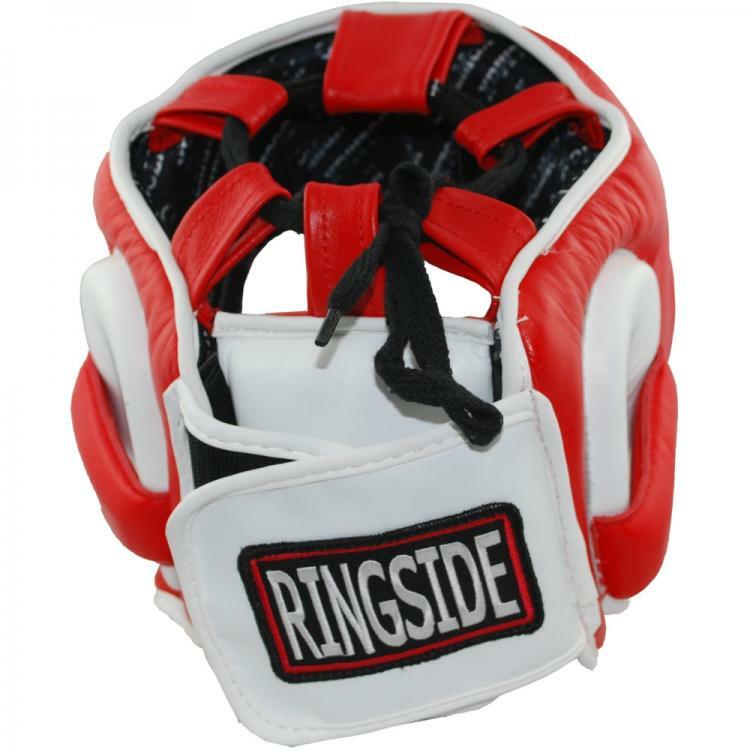 The Ringside headgear consist of a tough leather construction for the exterior and a fantastic moisture wicking interior lining. Additionally, the interior material helps grip onto your head even when you are sweating profusely. This headgear will feel a bit tight when you first put it on and will need to be broken into a bit. It should feel more comfortable after consistent usage. A large protective padding is also located in the rear where the two big adjustable velcro straps is present. The top portion of the headgear is tighten with a standard lace crown design. These design components makes it comfortable and easy to adjust. 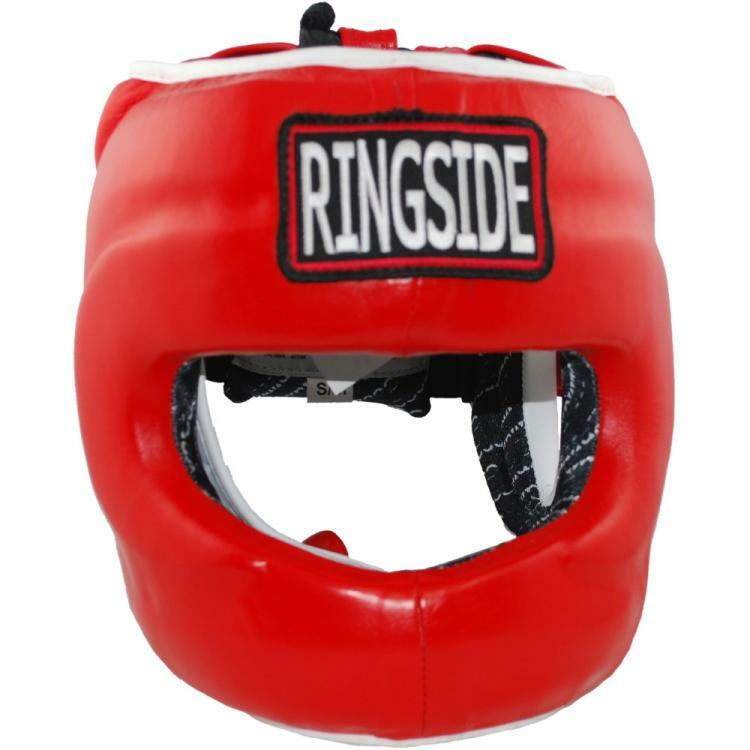 Ringside Deluxe headgear does a great job of keeping the face of boxers unharmed, which is important for individuals that cannot risk going to a working environment with bruises or a broken nose. Furthermore, it is a great choice at an affordable price. Fighting Sports offers a one size fits all headgear for adults with full 360 degrees of protection. Its face bar structure is composed of a molded plastic covered with foam padding. Additionally, it has a clear distinct looking face bar that is larger than the other options on this list. This results in the user’s lower line of sight to be impeded a bit more. 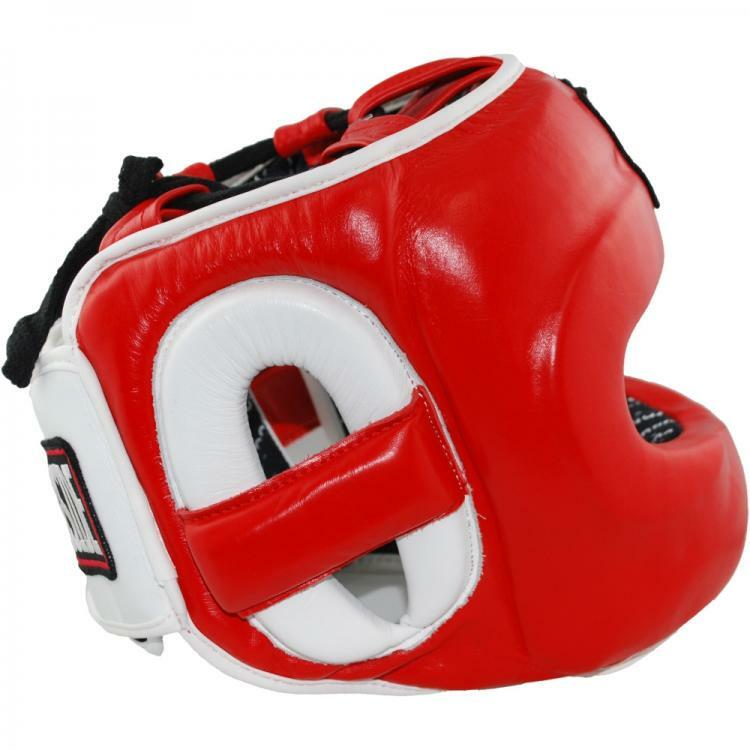 Fighting Sports headgear has multiple layer of foam padding that are thick and highly protective. The exterior padding consist of high density foam while the interior has a low density foam padding. This combination does a good job of cushioning the impact felt. The Fighting Sports headgear is quite big relative to other face savers. 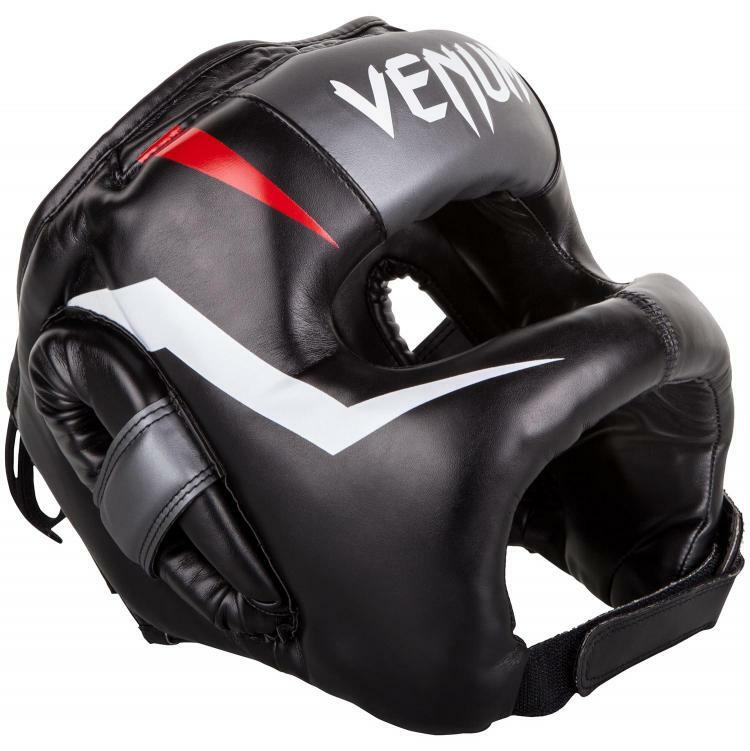 Fighting Sports headgear is constructed from full grain leather, which means that it is extremely durable. However, it also means that this headgear will need to go through several sparring sessions to be broken in to fit comfortably. Another downside of having leather as the interior material as well is how the headgear may slide around once the user start building up sweat. If protection is your highest priority, this Fighting Sports headgear is a solid choice. Rival’s Guerrero is a slick looking face saver headgear that is available in a large assortment of colors. It has an all leather construction with synthetic leather interior. The fitting for the Guerrero consists of rear dual straps that relies on the hook and loop closure system, also commonly refer to as Velcro, while the top portion of the headgear has a circular lace top. The hook and closure straps settle into place over a thick, large foam padding that protects against accidental hits to the back of the head. The Rival headgear has two plastic D rings for the Velcro straps to loop through and tighten down before they are secured into position. Rival designed the Guerrero headgear with a well padded chin strap. This component is a nice touch for increasing the comfortability factor. The Guerrero headgear incorporates a plastic frame designed for better visibility while maintaining a strong structure against direct shots to the face. One of the biggest negative trait about the Rival headgear is its weight. During long training sessions, the weight may feel bothersome over time. Their design looks similar to Cleto Reyes, has high quality stitching and can be purchase at a lower price point. 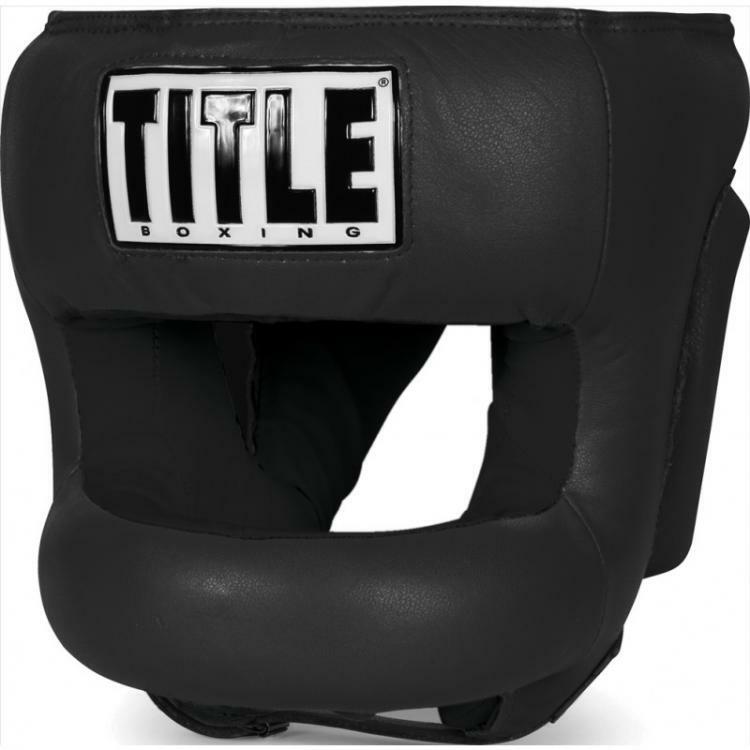 Title Boxing sells a nice and minimalistic looking headgear that is only available in black and red. Despite being an one size fits all headgear, its adjustable features does a good job of securing the headgear in place even when taking a hard shot. Be careful when trying to buy a pair of these online. The older version is adjusted with only laces. The current version of this Title headgear has a lace crown and a hook and loop closure system to complement it. In addition to that, the newer version swapped out the original interior material for a suede one that is extra comfortable. Therefore, it is important to make sure you are getting the version that you actually want. The face bar does a great job of preventing the opponent’s punches from doing damage to the user’s nose and mouth. The visibility of this headgear is only ok. Other than the major visibility hindrance by the face bar, the peripheral vision is also slightly impeded. This Title headgear is not as light or slim as the Winning FG-5000 and the stitching quality of this headgear is not as good as the other ones on this list, but it is still a fantastic option if you do not want to break the bank for your first face saver headgear. The Elite Iron headgear is a handmade product from Thailand. Despite being composed from synthetic leather, this headgear has a tough and sturdy exterior with high quality stitching. 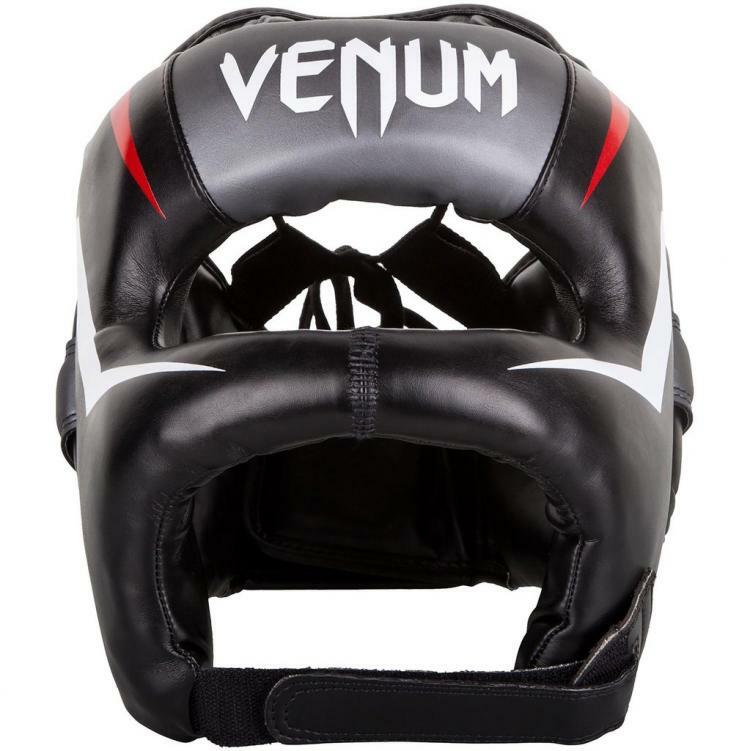 The headgear’s layered foam padding is hard on the outside with the soft foam padding inside. This combination is great at softening the brunt force delivered by hard strikes. The Elite Iron is a lightweight face saver headgear with outstanding ear protection that consists of cushy perimeter paddings and padded ear bars. Its most distinct feature is that it utilizes a Velcro chin strap instead of the standard metal buckle. Combining this component with the large Velcro pads on the rear part of the headgear allows for quick access and easy adjustability. However, this chin strap is far from being perfect. The chin strap is not padded and can be uncomfortable. If you enjoy having a headgear with an attractive appearance that stands out in the gym and offers great protection, then this Elite Iron headgear should definitely be one of the top choices for you.